All SARTrack (Clients) must connect to a Database Server (which is automatic on the local LAN), and will require a Login and Password. There are several layers of access: Supervisor, Operations, Data Entry, Read-Only and 'Database Server'. Only the Supervisor can add new Users on the Database Server, and give them the required access level. With the SARTrack Database Server system now in place, it is NO LONGER POSSIBLE to use the APRS-IS network to link SARTrack computers together. This must now be done using one or more Database Servers. The only reason to connect to an APRS-IS Server would be to receive APRS Tracker information, and in this case only ONE SARTrack client should connect to it, as this client will forward the APRS data to all other connected SARTrack clients via the Database Server. And the SARTrack "GroupID" you use for your organisation. I will set you up on the server with Supervisor access, and you can change your password later if you wish. See below on how to set up the SARTrack Client to directly connect to this Database Server. Since November 2017, NZSAR has installed a New Zealand based Database Server for NZ SAR groups only. To be able to use this server, please send an email to info@sartrack.co.nz with your Group name, and I will allocate you a 'GroupID' and Callsign range. For local use (In the field, and at a Permanent Base), you install a Local Database Server on ONE computer only. See below for the Setup procedure. Please have a look at the recommended Database / SARTrack Clients Setup for both a Permanent Base and Remote location. If you are going to install your own Internet Based Database Server, you must set this one up first. Details on this in Advanced Setup. After installation you will see a new Icon on the Desktop with an "M" in it, called SARTrack Server Monitor. When you click on this, it will start the "SARTrack Monitor" program, in 32 bit mode. This program will detect if you have a 32 bit or 64 bit operating system, and then start the correct "SARTrack Server" version. The 'Monitor' program will check if the Server is still running, and will attempt to restart the Server if it is not running. The "Monitor" program will minimize itself into the Windows Icon tray, from where you can open it to close/restart the Server. On first start of the Database Server, the Setup window will open. In the primary Setup, use a *** UNIQUE *** CALLSIGN/SSID!! Never should any Callsign/SSID be the same as any other SARTrack Server or SARTRack Client callsign/SSID. Every SARTrack computer (Server or Client) MUST have a unique callsign/SSID! Examples: CALLAA, CALLAB, CALLAC, CALLAC-1, CALLAC-2, CALLAC-3, etc. are all different and are okay. The option "Server is the Internet Master Server" should NOT be ticked, except when you are installing your OWN permanent Internet based server, please see below for Advanced Setup). The difference between a "Local Database Server" and an "Internet Master Database Server" is with this menu selection "Server is the Internet Master Server" and it will completely change the behaviour of the Server, so take care with this setting! There can only be one Internet Master Server. Please click on the Help button in Setup for full information on the required settings. NOTE: To connect direct to your own Local Database Server for the first time, log in with the special login name: "ServerAdmin" and the special password which you have just set up in your local Database Server Setup. This gives you 'root' access to the Server. In this state you have full access into the local Server regardless of the 'GroupID' you have set up in the SARTrack client, but when you add/edit more Database Users, these will be generated under the 'GroupID' which you have set in SARTrack client at that moment. This is mostly an issue if you are setting up your own Internet based Master Database Server, which may serve more than one 'GroupID'. You can program the Local Server to connect to an Internet based Server to synchronize the (Active Operation) database between these two servers. 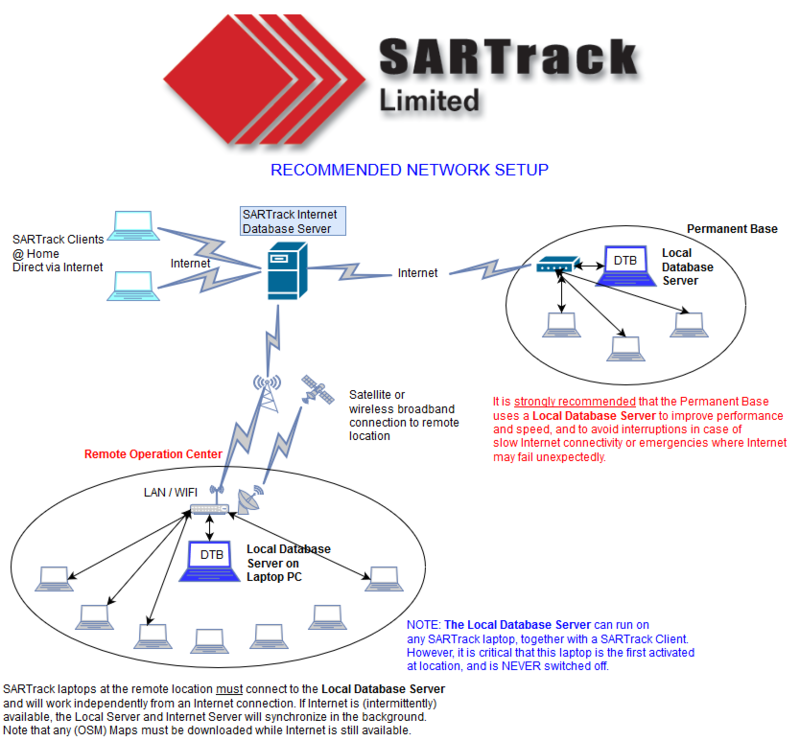 This is a powerfull feature, as it allows you to work in a remote area, with multiple SARTrack clients connected via a local LAN or WIFI, but have SARTrack clients anywhere in the world linked into the Operation via the Internet based Server. This will work even with an intermittent Internet connection (Satellite link or Mobile Broadband), as the two Servers will re-synchonize on re-connect, and immediately update all SARTrack clients on both sides. See this image on how this works. Please read the Server help for more details. NOTE: Be aware: You can only connect your Local Server to an Internet Master Database Server when a special DTB Login & Password has been set up for it there! First use your SARTrack client to connect to the Internet Master Server (using your personal Supervisor Login) and add a special Login & Password for your Local Database Server in 'DTBUsers' with an access level of "DatabaseServer". Then set up this same Login and Password in your Local Database Server 'Remote Server Setup'. You can not connect your Local Server to the Master Server using your own personal 'Supervisor' level login! 1) In the Connection Menu, right-click on Database, and select 'Setup Database Server''. 3) Login to the Master server using your personal Supervisor Login and password. Make sure you use the correct GroupID ! 5) In your Local Server Remote Connection setup, select the same name or IP address of your Internet Master Server and the same Login and Password you have just set up for this LOCAL Server there. Do NOT try to use another Login, it must be the special Login with an Access Level of "DatabaseServer". You can now connect your Local Server to the Internet Database Server. Do make sure to add more User logins on your Database Server for all other users in your organisation, with the appropriate Access Levels (in most cases use 'Operations', not 'Supervisor'). NOTE: The Database User Login's (DTBuser's) and automatically synchronized between the Local Server and the Internet Server. Once you have set them up on one Server, they should be available on BOTH Servers after they have connected and synchonized. So all your users should then be able to Log into either the Local server, or the Internet Server as required. Make sure ALL your computers run the SAME and latest version of SARTrack, and are all set up with the same GroupID (in Setup>SAR). After logging into the Internet Master Database Server, or your own Local Database Server (using "ServerAdmin") you can add more 'DTBUsers' which are all other people allowed to log into the Server. - In the SARTrack "Manage Menu" click on "DTB Users" and enter new User accounts with their access levels, including one for yourself with Supervisor access. (If that was not already done) After that you should no longer have to use the primary "ServerAdmin" login when using a Local Database Server. The new 'DTBUsers' can now log in from all SARTrack computers connected to the Database Server. You can now logout, and then Login again using your own private DTBUser account. - Once connected, click on "Operations", this will open the new Operations Menu. - In the Operation Log window, start a new Active Operation (Supervisor access required). On all SARTrack clients, in "Connection Setup>Database", set the Database Server to be used (or Automatic when on the local LAN/WIFI) and select "Connect to Server". SARTrack will ask the user for a Login and Password. When correctly entered by the operator the Client will connect with the preset Access Level and download the databases. If a new Operation has started it will close all Windows, switch to the new Operation, and re-open the Operations Log window. Note: If you run a SARTrack client on the same computer on which the Local Server is running, the 'Server' field will be fixed at 'localhost'. If you want to connect to another Database Server, you must shutdown the Server on the local computer first. If you wish, you can now try to connect one of the SARTrack computers to an APRS Server on the Internet, or a radio/satellite based tracking device. All data received from the APRS network or device should now appear on all Server connected computers. NOTE: Only ONE SARTrack computer should be connected to the Internet APRS-IS network! Please report any problems (in detail) by using the Debug window, 'send Bug report' and attach the Debug file. In some cases it may be required that you send it from all affected computers (including the Server! ), so I can compare the Debug logs. Please report ALL problems and bugs you may encounter. I rely heavily on feedback to be able to fix bugs in the program. You can only have ONE Internet Master Server. When installing on a VPS, this will generally be a Microsoft Server. Any version will do, the cheaper the better. SARTrack German server runs on Microsoft Server 2012. 1 Gb memory is more than enough, and diskspace is also barely required. Just select the cheapest option. After downloading and installing the Database Server, you can initially proceed as per Local Database Server above, except that you now check the box "Server is on the Internet". This will completely change the way the Server interacts with all connected Clients. Once the Server is running, you will have to open up the Firewall ports in the Microsoft Server. Even if you are using a desktop version of Windows, you still need to give SARTrackServer32.exe or SARTrackServer64.exe full Internet access. When it is required to select the actual Ports: SARTrackServer uses the following INCOMING ports: 8050, 8051: Primary and secundary TCP ports. 8052: DebugLog port. 8053 HTTP Web port (NOT Port 80). So, you can open a range of incoming TCP ports: 8050 to 8053. The Server also uses OUTGOING ports for SMTP (Normaly port 587) and the FTP port. Then the SARTrackMonitor.exe program requires OUTGOING access to the FTP port 21, to be able to download the Updates. Once you have all this done, you may need to restart the Database Server (via the Monitor program). The initial Login to the Server (using a SARTrack client) must be done with the special Login name of "ServerAdmin", and the password you have set up in the Server Setup for this. Do make sure that in the SARTrack client, you have set up the GroupID you are planning to use. You can now click on the 'DTBUsers' button in the Management Menu and start adding more Database User Login's, and one for yourself. You also need to add special DBBUser Login's for your Local Database Server(s)s. each with the special Access Level of "SartrackServer". IMPORTANT: At the present time, the Database Server runs in Windows 'User space': It will only run after you have logged into Windows! The Database Server does NOT run automatically after a Windows reboot. You must first log in for it to run, and you cannot Log log out, else the Server will stop. Instead of logging out, just use the Switch User option, or when connected to a Windows Server with Windows Remote Desktop, just close that session, and the Login will stay active.